When I turn on Activated Stories, all fighting ceases. Thanks, Kimberly and Dennis, for knocking it out of the park month after month. We've been listening for many years. My three kids (10 and under) eagerly wait for each and every story. We love that the tales are told in such an amusing manner and reflect so many cultures. The Gozas also share their travels and reflections. I wish this was updated every week! I've been listening for almost 5 years, and this is a very entertaining podcast. I even called in once when they had a contest, and I won! I can't believe that this podcast isn't more popular, it is one of my favourites. For every 6-minute story, brace yourself for 6 more of mindless chatter about where the narrators ate breakfast and where their bus is heading next, and then another 6 minutes of chirpy blather that no one cares about but them. I can't imagine how they think their target listeners - children, no? - would care for any of this. The stories themselves are loaded with the narrators' snide(and annoying) playful comments. Very painful to listen to. Activated Stories is my kids' new favorite podcast. They have started checking my ipod to make sure we have downloaded episodes for our trips. There are enough asides and puns to keep me as involved and amused as the kids too. Currently, their favorite is The Jester and The Straw Roof for Zephyr's Heath Ledger impersonation. Hi , storytellers! I just wanted to say I really love your podcast , and if you remember , you received a phone call from someone from the Bay Area requesting a Dutch folktale a while back? Well , that was me! Thank you for doing that Dutch folktale about the elves , it made me laugh! The storytellers retell classic stories, the ones every kid should know, and as they tell them, they ad lib little anachronisms and comments for comedic value. Entertaining and educational and excellent. 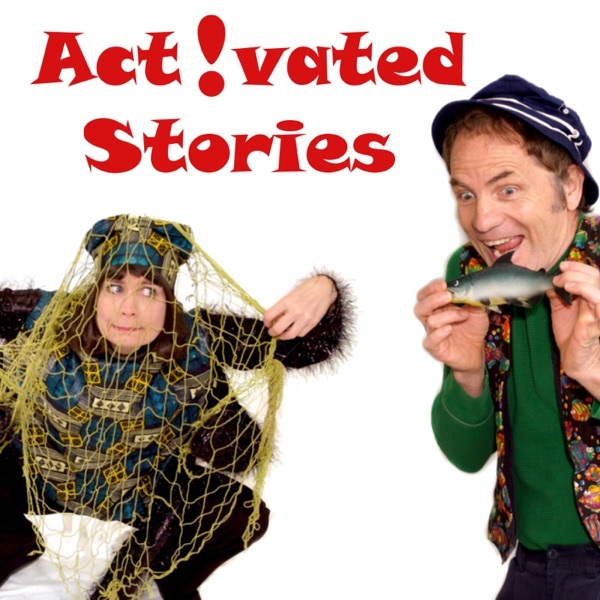 There is something delightful in each Activated Storytellers podcast. Each family member is quite funny and poignant in their own ways, but it is the dynamic they bring that makes each podcast captivating, amusing, and educational. Each podcast relates tales from their life on the road (they travel 365 days a year putting on shows in schools and libraries) and relate each story they activate to their location, to their travels. The father, Dennis, brings a sense of gravitas and history to each story, often relating some interesting fact (like, where the word "spoonerism" comes from) and also a dry wit. The mother, Kimberly, has a wicked sly wit and outstanding energy which shines through each cast. The son, Zephyr, displays an amazing ability to do impressions--anyone from Jack Sparrow to Napoleon Dynamite. Together, they breathe life back into stories, to show how stories save lives, and do so with such laughter and energy that listening becomes an exquisite delight each and everytime. Dennis, Kimberly, and the notorious Zephyr have a wonderful show. The show is from their family to yours, and includes not just short stories read aloud, but some behind the scenes stories as they travel the country. The performed stories are excellent, and the production is first rate. It's fun, lighthearted, and addicting for the whole family. Story time has never been so much fun as with Activated Stories, and you and your family will love each and every podcast. Two big thumbs up! I am now back in the classroom teaching students who have disabilities. My own children, are growing up, one in college, the other back in the public school class room. I do miss my homeschooling days, of being able to be at home with my own children. I am now able to have my students listen to these wonderul activated stories as part of our classroom activities.